There is provided herein a pacifier for nasal delivery of vaporised medicament. The pacifier comprises a mouth shield (101) and a teat (144) extending proximally therefrom. The pacifier further comprises a rear housing (102) attached to a rear of the mouth shield. Furthermore, the housing has a medicament container (103) therein and a vent (104) for exuding medicament vapour therefrom. Furthermore, the housing is configured such that the vent (104) locates beneath the nose of the infant whilst sucking on the teat. In accordance with various embodiments, the medicament may be provided in differing forms, such as in liquid form, impregnated in a media (such as a sponge or the like) or in pressurised form (such as, for example, comprising a pressurised asthma pump container). Furthermore, the pacifier comprises an electric vaporisation control device configured for controlling the vaporisation of the medicament vapour from the vent. 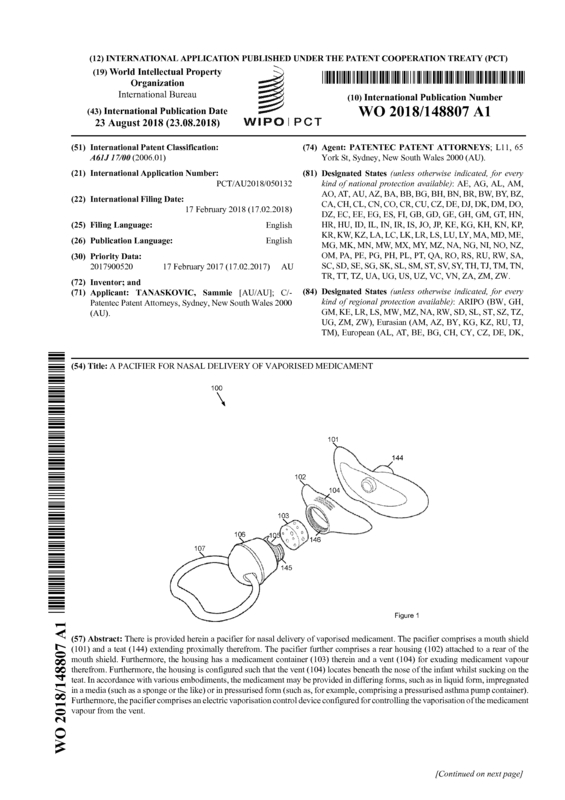 Page created at 2019-04-25 18:12:51, Patent Auction Time.